Summer is not summer without a day at the beach and Northern Michigan offers some of the best beaches anywhere. Yes, the tropical climates offer some great beaches but here, well, our beaches rival the best. With so many great beaches in the northland, you don't have to fight the crowds and the sun, sand and surf are yours to enjoy. Pack a picnic lunch and the sun screen and head to the beach. Crooked Lake On the shores of Crooked Lake in Conway is a spot favored by wind surfers. These shallow waters and sandy shores are great for families as well as serious wind aficionados. Ferry Beach Lake Charlevoix's inviting waters lure swimmers into this great spot. Located within the city of Charlevoix, this is a great family spot and the place to be on windy days if you're not a surf lover but the waters are calm. And the warm waters are great all season long. Fisherman's Island State Park Located just south of Charlevoix, this great state park has everything you could ask for in a beach. The views of the setting sun are million dollar moments. Harbor Springs Zoll Street Beach This tiny beach sandwiched between Wequetonsing and Walstrom's marina is the area's best kept secret. For a perfect sumer swim, hit the water here and swim past the cottages of Wequetonsing. Many sailors and sail boarders love this beach. Dogs, too as this is a dog friendly beach. Harbor Springs Zorn Street Beach Locally known as "the beach," this spot really is a beach scene. If you want a social setting along with sun and fun, this is the place to be. 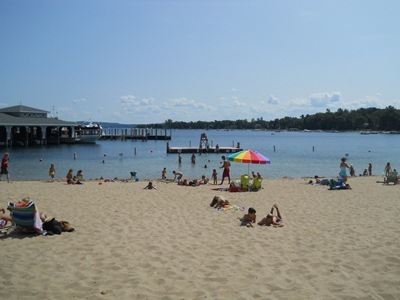 Hang out on the sand, swim out to the rafts and then walk a block to downtown Harbor Springs for an ice cream cone. Michigan Avenue Beach Few towns can boast such an incredible beach right within the city limits. Charlevoix can! This Lake Michigan beach has something for everyone including a view of the boats passing in through the channel to Lake Charlevoix. Middle Village Beach Located down Lampkin Road from nearby Good Hart, this beach has great sand, sun, waves, and peacefulness. Watch the sailboats pass by on their way to Harbor Springs from the Mackinac Island races. On clear days, Beaver Island looks like it's within stone tossing distance. Petoskey State Park One European family on their second visit to Northern Michigan spent a day at this beach and remarked, "Why didn't we come here last year? It's better than anything in Europe!" Miles of sand, Petoskey stones, great dunes, camping, picnicking, waves, and incredible sunsets await beach goers. Sturgeon Bay Wow! That's it in a nutshell for this special spot. Located along the shores of Lake Michigan between Cross Village and Mackinaw City, this beach has miles of sand and dunes and on windy days, excellent waves for playing. Young State Park Just outside of Boyne City on Lake Charlevoix is a great inland lake beach. 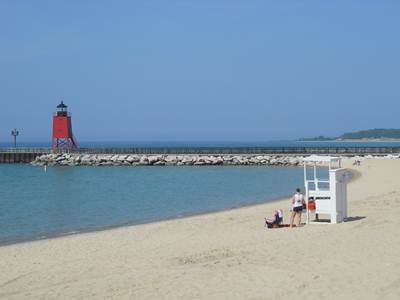 The shores of Lake Charlevoix are wonderful for swimming, sunning, and playing in the water. Don't let summer pass by without a trip to the beach. A northern Michigan beach day is one that will create memories for years to come.